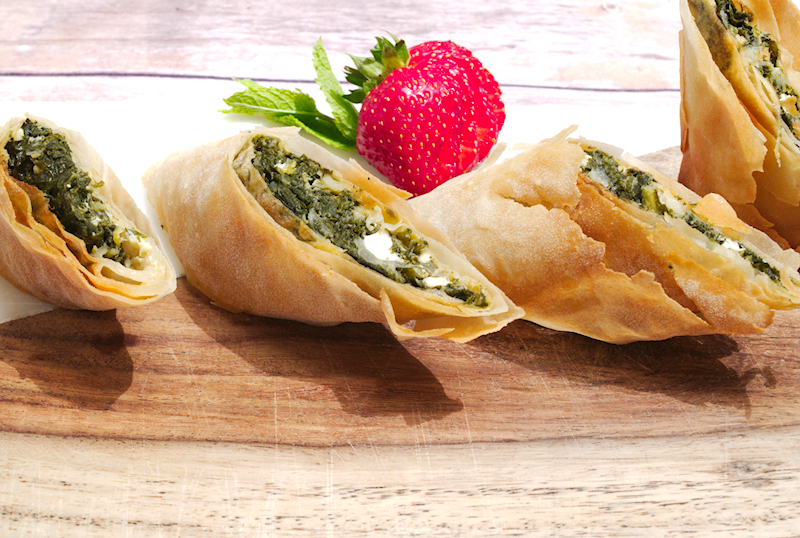 A recipe for kale and spinach filo rolls with dill and feta cheese. 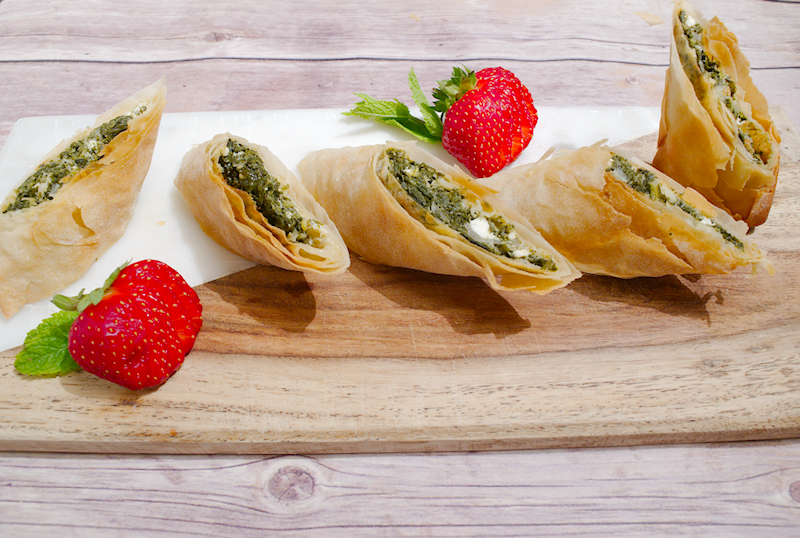 A delicious treat to boost yourself with iron and vitamins. As I continue my culinary journey to the land of pastries, I had to do some rolls involving my favorite greens. 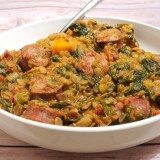 Spinach and kale. Both spinach and kale are very nutritious and can boost your immune system with vitamins and iron. In terms of taste, I think that they complement each other. You have the slightly bitter taste of spinach and the “nuttier” taste of kale. Win-win situation. 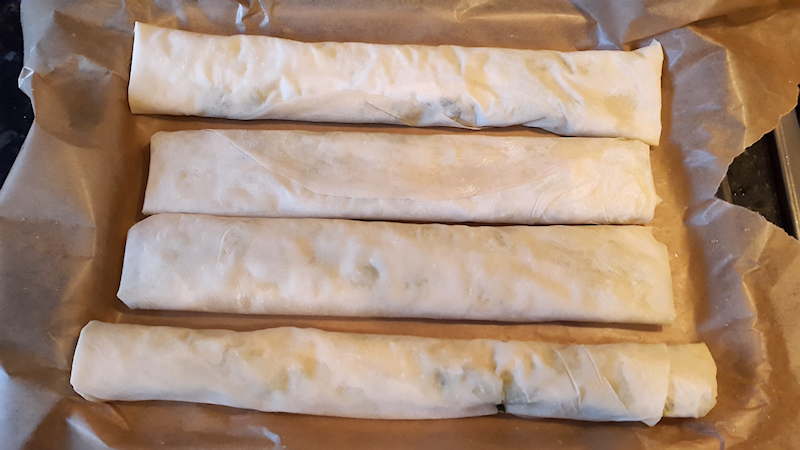 Onion and leek is a standard addition in the famous Greek spinach pie (Spanakopita) so I am using them here too. Spinach and fresh dill go so well together so I couldn’t do without dill’s aroma. As always, the choice of the filo pastry makes most of the difference. Simple filo sheets from the supermarket will do fine. 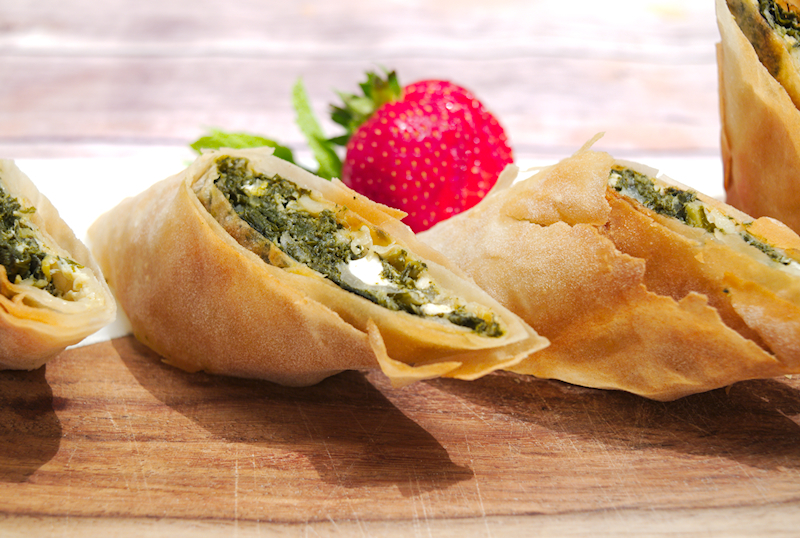 I used hand-made “village-type” Greek filo and it was delicious. 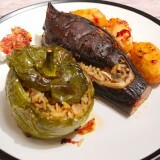 You could also use Yufka sheets and pretend you are making Turkish Boreks! 400 gr (14 oz) kale chopped (the hard parts removed). 200 gr (7 oz) fresh baby spinach chopped. 1 large yellow onion finely chopped. A bunch of fresh dill finely chopped. 200 gr (7 oz) crumbled Feta cheese. Wash the spinach and kale and let it drain in a colander. Add the olive oil in a deep pot and heat it up at medium heat. Add the onion and leek and cook until it starts getting brown. Add the spinach and kale and stir well. They will reduce in size as they get cooked. Season with pepper and cook for ~ 10 minutes (with occasional stirring) until they release their juices. Add the dill and stir well. Remove from the heat and drain the juices using a colander. Put the mixture back in the pot and let it cool down for ~ 30 minutes. 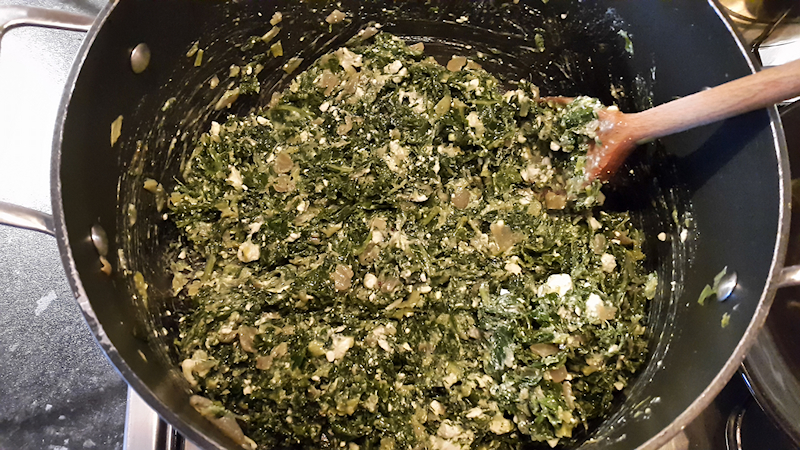 When the mixture has cooled down, add the Feta cheese and the egg and stir well. Preheat the oven at 180 degrees (360 F). 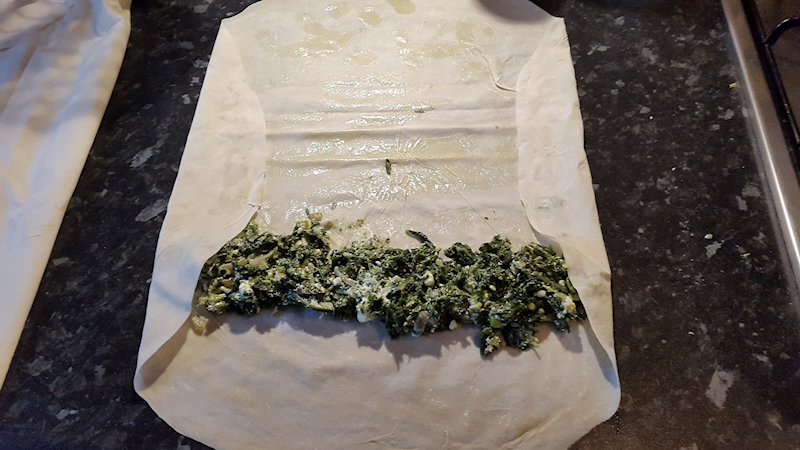 To make long rolls, take one of the filo sheets and place it on the bench. Use a kitchen brush and spread some olive oil on its surface. Add some of the mixture (~ 2 tablespoons) close to the top of the sheet. Fold slightly the edges (so they are sealed when rolled) and roll it to create a nice and tight “cigar”. Place it on a tray covered with parchment paper. Repeat with the other filo sheets. 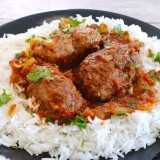 Use the kitchen brush and spread some more olive oil on the rolls. Bake in the oven for ~ 30 minutes until golden brown.